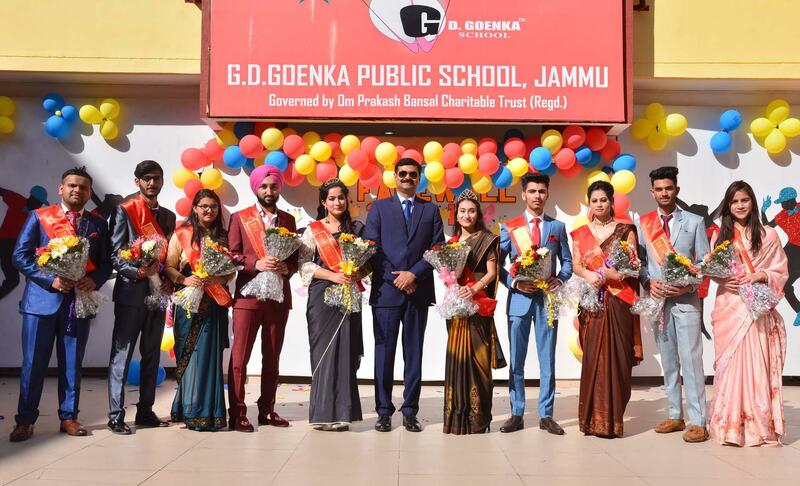 To bid adieu to the students of itsoutgoing batch of class XII, G D Goenka Public School, Jammu governed by Om Prakash Bansal Charitable Trust,organized a farewell function in the Goenkan Acres. The farewell function is a memory that students take with them after school and it is a day devoted to the years spent together with friends & teachers to reminisce joyous moments. The students of Class XI put forth a mix of scintillating dance performances and Songs. The cultural presentation had an amalgamation of melodious songs, instrumental orchestra&pullulating rap that was enjoyed by one and all. Various innovative games were organized for the students wherein they displayed their talent and wit. The outgoing students delivered speeches expressing gratitude to their mentors &teachers for their valuable contribution in making the journey a memorable one. The much awaited event of the day was the presentation of awards. The students walked on the ramp and displayed the talent in their chosen area. Based on their performance a panel of jury conferred on them the coveted titles. Master VanshPadhiar was chosen as Mr. Talented, whereas Ms. Prachi Bhagat was selected as Ms. Talented. Ms. NausheenThusoo was adjudged Ms. Goenka, whereasMaster Vasu Gupta was declared Mr. Goenka. Based on the appearance and attire, Ms. Priyanshi Kapoor was unanimously chosen as Diva of the Eve and Master Brahmjyot Singh was titled Man of the Eve. Candle lighting ceremony was also organized which represents a tradition which is handed over to the next senior most class. The passing ofcandles from the office bearers of outgoing Class XIIstudents to Class XI students depicted that the tradition shall be maintained. Sapling plantation was done to preserve the environment. Cherry on the cake was the Cake cutting ceremony, which made everyone cherish the sweetness of the day. The day concluded with the sumptuous lunch.